The redwoods of Northern California are ancient—some are over 2,000 years old—and are the tallest trees in the world. A section of the park is recognized as UNESCO World Heritage Site, so visitors can find campsites that allow them to enjoy nature in one of the most breathtaking spots on earth. With three campgrounds in the forest and one overlooking the Pacific Coast at Gold’s Bluff Beach, Redwood National & State Parks offer unforgettable views and attractions. Spanning Northern to Central California, Big Sur is a must-see destination for any fan of the great outdoors. The home of three Native American tribes (The Ohlone, Esselen, and Salinan), much of the land here is undeveloped, so hikers have the perfect opportunity to enjoy sensational trails and views of the mountains and the coast. 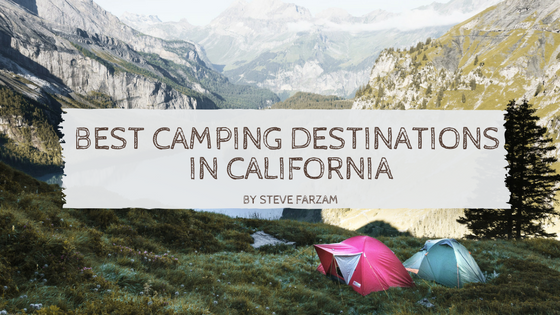 Big Sur draws close to three million visitors per year and provides an unparalleled camping experience from its sandy beaches to its rugged coastline. Covering over 1,100 miles of terrain, Yosemite is a UNESCO World Heritage Site. Featuring waterfalls, giant sequoia trees, and tons of wilderness, Yosemite should not be missed. The park is quite popular, with nearly four million visitors per year, and it has also been ranked as one of the top-five national parks for camping. Throughout the park, there are lakes, ponds, hiking trails, and 13 campgrounds that feature tents, RVs, and horse camping. Further down the coast, you will find Santa Barbara County. Visitors can choose from five different beachfront camping sites, or, if they’d prefer, go glamping instead. The El Capitan Canyon Resort, for example, offers luxurious glamping tents and fully-equipped cabins that come with maid service. There are also unique campground features, such as the ability to rent an iconic airstream camper.